The 2016 RAM 1500 competes in the full-size pickup class. One of its closest competitors is the Chevy Silverado. The RAM 1500 is one of the top competitors in work/family trucks, thanks to a winning combination of strong powertrains, a smooth ride and a well-trimmed cabin. The Chevy Silverado is powerful, with fuel-efficient engines; many available configurations; well-built, comfortable interior; quiet highway ride. However, standard six-speed automatic transmission's ratios are too widely spaced for optimal towing performance; eight-speed auto only available on upper trims; doesn't have much to offer against competitors' unique strengths. Adjustable air springs allow drivers to raise and lower the vehicle to one of five ride height settings. A heavy load can make it hard to get moving forward. Hill Start Assist detects when your truck is on an incline, so when you take your foot off the brake you don't roll backwards. The 2016 Ram 1500's base engine is a 3.6-liter gasoline V6 which generates 305 horsepower, optional are the legendary 5.7 HEMI® V8 Engine with Fuel Saver Technology, and the fuel efficient 3.6L Ecodiesel V6 Engine. Our Ram trucks have evolved from decades of rigorous testing and safety and security improvements to deliver one of our most advanced trucks on the road. While the 5.7-liter V8 has the highest rated towing capacity, the diesel V6 is a close second, and it offers much better fuel economy to boot. Standard on all but the LTZ and High Country trims is a 4.3-liter V6 with 285 horsepower and 305 pound-feet of torque. It comes matched to a six-speed automatic transmission and either rear-wheel or four-wheel drive. The 5.3-liter V8, which is standard on the LTZ and High Country and optional on other Silverados, makes 355 hp and 383 lb-ft of torque. On WT, LS and LT trims, it is matched to a six-speed automatic, but can be paired to an eight-speed auto in LTZ and High Country models depending on the configuration. The Ram 1500's cabin is as good as it gets in the pickup segment. Even the lower trim levels boast an attractive design, with satisfactory materials and intuitive controls that are reasonably easy to reach, while the available wood trim and premium leather upholstery are predictably posh. Seasoned truck owners might be thrown off at first by the rotary shift knob on the dashboard, but it quickly becomes second nature, and it frees up useful storage space compared to trucks with console-mounted shifters. The front seats themselves are soft, yet strike an adequate balance between support and comfort. The crew cab's rear seat is very comfortable, offering loads of legroom and an agreeable seatback angle. That smooth ride remains one of the Ram's most distinctive traits, and it comes courtesy of the class-exclusive coil-spring rear suspension, which is better at smoothing out and reducing the harshness of rough road surfaces than the typical leaf-spring setup. Inside, all versions of the Chevy Silverado have high-quality materials, and we've been impressed by the build quality in all the trucks we've tested. There are numerous bins and cubbies, a deluge of cupholders and enough USB ports to keep all your devices charged and happy. Both touchscreen infotainment interfaces feature straightforward menus and effective voice commands. Apple CarPlay and Android Auto are even easier to use because they effectively ape the respective smartphone interfaces that users are already familiar with.In addition, the current Silverado is better insulated from noise than ever before, and city potholes and grooved highway pavement seldom intrude on the cabin's calm. Finally, clambering into the cargo bed is made easier by clever steps and handholds built into each rear corner. 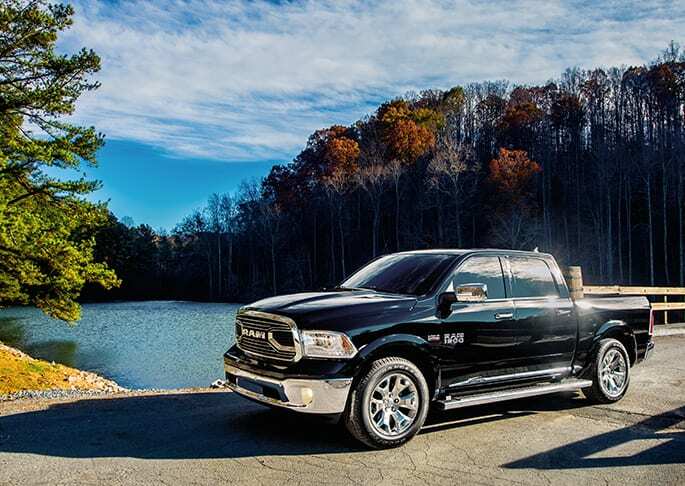 From the driver seat, the Ram feels more refined than its competitors, as its ride quality is smoother and steering more precise than you'd expect in a full-size truck. Running at speed on the freeway, the Ram 1500 is impressively quiet and composed. It gets even better when fitted with the available air suspension. The Ram 1500 is equipped with some of the most advanced safety and security technology available. With dynamic crumple zones, side-impact door beams and an advanced airbag system, your Ram truck is engineered to help protect your most precious cargo. The 2016 Chevy Silverado's ride is much stiffer with the Max Trailering package. In our long-term test of a Silverado 1500, we found this truck extremely livable for daily commuting and long road trips alike. A muscular front end, sculpted hood and signature LED lighting accents give Silverado a bold new look, while high-strength steel delivers rugged capability that you can depend on day in and day out. Given its size and focus on utility, the Chevy isn't exactly agile around turns, and there's plenty of body lean if you push it harder. But in normal driving it feels confident, and the steering is well-weighted. Off-road, the Silverado exhibits excellent composure when bouncing around on rocky trails.